Giovanni Cassini discovered Iapetus, a satellite of Saturn, which he could only initially see on Saturn's western side because of its unusual coloration. J. Palisa discovered asteroid #279 Thule. M. Wolf discovered asteroids #495 Eulalia and #496 Gryphia. US inventor Lee de Forest applied for a patent for the diode vacuum tube detector, a predecessor of his triode invention that first made electronic signal amplification possible. K. Reinmuth discovered asteroid #962 Aslog. Transcontinental & Western Air (T&WA) began the first scheduled transcontinental air service in the US, between Los Angeles and New York City. The route took 36 hours, the planes only flying in daylight, passengers slept overnight in Kansas City hotels. Russell L. "Rusty" Schweickart (born 25 October 1935, in Neptune, New Jersey, USA) became an astronaut in October of 1963. He spent over 241 hours in space on one spaceflight. In 1969, Schweickart served on the Apollo 9 mission during which he piloted the Lunar Module. This was the first manned test of the Apollo Lunar Module, as well as the first broadcast of music from space. Schweickart was awarded the NASA Distinguished Service Medal, and the NASA Exceptional Service Medal in 1973. Rusty Schweickart has spoken and taught at the Esalen Institute (considered to be the center of the Human Potential movement). Schweickart is also cofounder of the B612 Foundation, a group that aims to defend Earth from asteroid impacts. Tappan sold the first commercially available microwave oven, a 220-volt wall-mounted unit that cost $1495. NASA launched the Gemini 6 Agena Target Vehicle (GATV6) from Cape Canaveral, Florida, which failed to reach orbit, causing cancellation of Gemini 6. Because of this setback, the idea of launching Gemini 6A to rendezvous with Gemini 7 was born. The Gemini 6 Agena Target Vehicle (vehicle GATV 5002) was launched from Cape Canaveral, Florida on 25 October 1965 at 10:00:04 AM EST (15:00:04 UT) on an Atlas-Agena D rocket. At 10:05:12 AM EST, 5:08 after launch, the Agena separated from the Atlas successfully and all signals were normal. 376 seconds (6m16s) after launch, at the initiation of the Agena target vehicle primary propulsion system firing for Earth orbit insertion, telemetry and radar beacon track were lost and all attempts to reestablish contact or radar track with the vehicle failed. Just before the loss of contact, telemetry showed a marked rise in pressure in both propellant tanks. Shortly afterwards, radar at Patrick Air Force Base reportedly "picked up 5 pieces" of debris at the point in space the Agena was supposed to be. The Gemini 6 launch, scheduled to occur 101 minutes later, was cancelled. Later investigation concluded the most likely cause of the failure was a hard start and explosion caused by fuel preceding oxidizer into the thrust chamber during ignition. 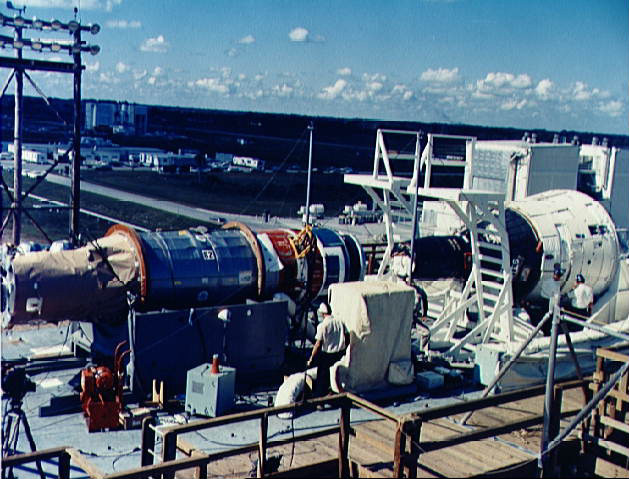 The Gemini Agena Target Vehicle was designed to be launched into Earth orbit prior to a Gemini mission and used for rendezvous and docking practice. The GATV had a docking cone at the forward end into which the nose of the Gemini spacecraft could be inserted and held with docking latches. The GATV was a 6 meter long cylinder with a diameter of somewhat less than 2 meters. (The 4.9 meter diameter stated on the NASA page is perhaps including the extended boom antenna: The base of the Gemini reentry vehicle - the black portion of the Gemini capsule in the attached photograph - is only 2.28 meters in diameter, the GATV diameter is considerably smaller.) The primary and secondary propulsion systems were at the back end of the target vehicle with the attitude control gas tanks and the main propellant tanks. The docking cone was connected to the front end by shock absorbing dampers. Acquisition running lights and target vehicle status display indicators were situated on the front end. A 2.1 meter long retractable L-band boom antenna extended from the side of the cylinder near the front. Tracking and command of the GATV were also aided by a rendezvous beacon, two spiral L-band antennas, two tracking antennas (C-band and S-band), two VHF telemetry antennas, and a UHF command antenna. Micrometeoroid packages and other experiments could also be mounted on the GATV. USSR Luna 12 entered Lunar orbit, from which it returned picures of the Lunar surface on 27 October. USSR launched Soyuz 2 from Baikonur as an unmanned docking target for Soyuz 3. P. Wild discovered asteroids #1911 Schubart, #1960 Guisan and #2037 Tripaxeptalis. USSR's Venera 10 made a day-side Venus landing, with the Sun near zenith, and returned data for 65 minutes before its orbiter moved out of relay range. It had succumbed to the heat before the next pass. R. M. West discovered asteroid #2147 Kharadze. A. Mrkos discovered asteroid #3017. USSR launched the Cosmos 1700 experimental centimeter band commsat from Baikonur, positioned in geosynchronous orbit at 95 deg E 1985-1986, the first Altair/SR launch to communicate with Mir and other spacecraft; the first Mir tests were on 29 March 1986. USSR launched Raduga 19 from Baikonur to provide telephone and telegraph communications and television broadcasting, positioned in geosynchronous orbit at 45 deg E 1986-1991; 34 deg E 1991-1993; performed an end-of-life maneuver 30 September 1993. The US Air Force launched the Navstar 38 (USA 135) geosynchronous military commsat from Cape Canaveral, Florida, on an Atlas IIA booster also carrying the USAF Academy Falcon Gold experiment to demonstrate use of GPS navigation in geosynchronous orbit. Russia launched Progress M-40 from Baikonur, an unmanned resupply vessel sent to Mir. Progress M-40 was launched to Mir on 25 October 1998. It docked with the rear (+X, Kvant) docking port of the Mir station on 27 October, and delivered fuel, dry cargo, and the Znamya-2.5 solar illumination experiment, a follow-on to the earlier Znamya-2 experiment on Progress M-15 in 1992. The 25 meter diameter Znamya reflector, which would unfold from the nose of the Progress, was to reflect sunlight over a 6 km area onto selected cities. Znamya-2.5 was developed by the Space Regatta Consortium, led by RKK Energia. Energia had long studied such space mirrors as a means of providing lighting to Siberian towns. The project was opposed by environmentalists and astronomers, who feared light pollution. Progress M-40 undocked on 4 February 1999 at 09:59 GMT, but the attempted deployment of the Znamya-2.5 reflector was thwarted when it snagged on a rendezvous system antenna. After two more failed attempts to deploy the antenna, the experiment was abandoned. Progress M-40 fired its engines at 10:16 GMT on 5 February 1999, braked out of orbit, and burned up over the Pacific Ocean.